The play "Shinjû Ten no Amijima" was originally written for the puppet theater (Bunraku) and staged for the first time in Ôsaka at the Takemotoza in the 12th lunar month of 1720. It was based on a real event that happened in Ôsaka the 14th day of the 10th lunar month of 1720: the double suicide in Amijima in the precinct of the Daichôji Temple of Kamiya Jihê (a paper merchant from the Tenma district) and the courtesan Kinokuniya Koharu (from the Kita-Shinchi pleasure quarter). 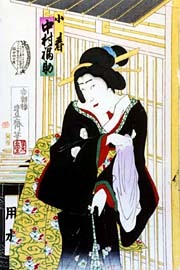 "Shinjû Ten no Amijima" was adapted for Kabuki the following year and staged for the first time in Edo at the Moritaza. The roles of Kamiya Jihê and Koharu were played by Ichikawa Ebizô II and Sodesaki Miwano I. 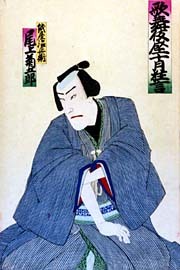 The "Shigure no Kotatsu" act, which was not in the original 3-acts drama, was written for Kabuki by the playwright Chikamatsu Hanji in 1781. 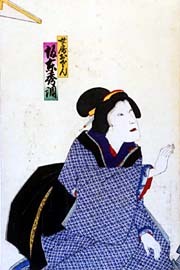 Although Jihê has a devoted wife and children, he falls in love with the courtesan Koharu and cannot bear to part from her. Unfortunately, she is about to be redeemed by one of her clients. Jihê sits at home under the kotatsu. He pretends to be asleep but his eyes are full of tears thinking about Koharu. This is where the title of the drama comes from. His wife, Osan, goes about the household chores. When their servant tells her that her mother and Jihê's elder brother, Magoemon, are on their way to call on them, Jihê goes to the shop front and makes himself look busy. In order to relieve them from anxiety about his selfish deeds, Jihê writes a sworn statement to the effect that he has broken with Koharu forever. But, in fact, he and Koharu have firmly promised to die together for the sake of true love. Similarly, Koharu does her duty to Osan and Magoemon by bidding Jihê good-bye at the teahouse Kawashô, pretending that she has become tired of him. Osan's women's intuition, however, tells her that her husband cannot forget Koharu. She realizes the two will commit double suicide if they cannot live together, and it will be her fault. She makes up her mind, therefore, to divorce Jihê to prevent such a tragedy. She implores Jihê to go to Koharu immediately and ransom her before she is bought by the other client. Osan donates what money she has and offers to sell her clothes and the children's to raise the full amount of the ransom. Just then Osan's father, Gozaemon, comes. He discovers that the chest of drawers is empty, and Osan's clothes are all bundled up. He is convinced that Jihê is stealing his wife's clothes to pay for his dissipation and peremptorily drags Osan away, leaving the weeping children with Jihê. Later Jihê and Koharu marry, but when they find out that Osan has become a nun they come to their senses. Koharu praises Osan's unselfishness and hints to Jihê that she intends to kill herself because of the sorrow she has caused her. Jihê, too, tells Koharu that he will die with her to atone for his sins against his wife. Thus they walk the road to death together at Amijima.